The red wolf was declared extinct in the wild in 1980 after the last known wild wolves were captured and taken out of the wild to begin a captive breeding program. 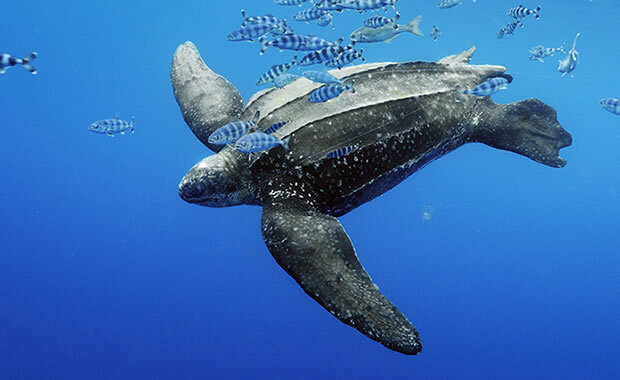 There are now an estimated 200 individuals found in North Carolina and other areas where they have been reintroduced. The red wolf is slightly smaller than its relative, the gray wolf, its build is more slender, and its head more elongated. Its coat is tawny red with some gray and black areas. Its back tends to be darker in color and its tail has a black tip. In the winter, the fur of the red wolf tends to be more reddish in color. Adults can reach up to 4.5 feet in head and body length (the tail can grow up to 13.8 inches) and can weigh up to 77 lb. Males are generally larger than females. Red wolves once thrived in a variety of habitats, including swamps, forests, wetlands, bushlands, and even agricultural lands with enough forest cover. Diet consists of rodents, deer, and other small mammals like raccoons and rabbits. Red wolves are primarily nocturnal and prefer to live in packs consisting of the mating pair and their offspring. Females generally give birth to three to six pups after a gestation period of 60 to 63 days. The parents and older members of the pack help to protect and care for the young. The red wolf species was nearly wiped out because of human population growth, hunting, and the clearing of forest, eliminating much of its habitat. Red wolves preyed upon livestock, and many were killed by farmers and ranchers. Reintroduced populations are said to be growing and thriving, as most wolves that are recaptured and tested are said to be healthy. Copyright Notice: This article is licensed under the GNU Free Documentation License. It uses material from the Wikipedia article "Red wolf". Glenn, C. R. 2006. 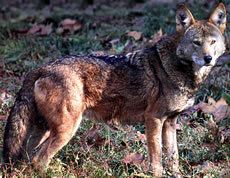 "Earth's Endangered Creatures - Red Wolf Facts" (Online). Accessed 4/23/2019 at http://earthsendangered.com/profile.asp?sp=938&ID=9. Need more Red Wolf facts?